Explore Seminyak's surroundings by going to Tanah Lot Temple (in Beraban) and Uluwatu Temple (in Pecatu). 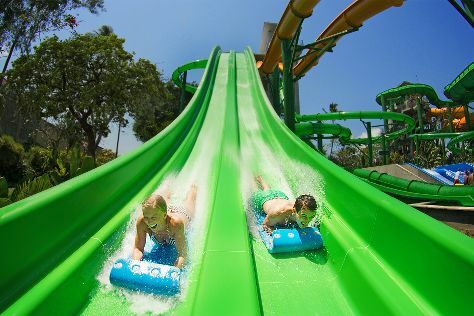 The adventure continues: make a splash at Waterbom Bali, relax and rejuvenate at some of the best spas, view the masterpieces at Reservoart, and test your problem-solving skills at popular escape rooms. To find traveler tips, maps, ratings, and tourist information, you can read our Seminyak travel planning tool . Cairo, Egypt to Seminyak is an approximately 20-hour combination of flight and bus. The time zone difference when traveling from Cairo to Seminyak is 6 hours. When traveling from Cairo in August, plan for a bit cooler days in Seminyak, with highs around 34°C, while nights are about the same with lows around 28°C. Wrap up your sightseeing on the 6th (Tue) early enough to travel to Nusa Lembongan. Kick off your visit on the 7th (Wed): discover the deep blue sea with a scuba or snorkeling tour. To find more things to do, traveler tips, where to stay, and tourist information, you can read our Nusa Lembongan trip planner. Traveling by combination of taxi and ferry from Seminyak to Nusa Lembongan takes an hour. Alternatively, you can do a combination of bus and ferry. August in Nusa Lembongan sees daily highs of 34°C and lows of 28°C at night. Cap off your sightseeing on the 7th (Wed) early enough to travel to Ubud. Kick off your visit on the 8th (Thu): relax and rejuvenate at some of the best spas, explore the fascinating underground world of Elephant Cave Ubud, then identify plant and animal life at Sacred Monkey Forest Sanctuary, and finally view the masterpieces at Threads of Life. Get ready for a full day of sightseeing on the next day: make a trip to Tegalalang Rice Terrace, look for all kinds of wild species at Elephant Safari Park, then take in the pleasant sights at Campuhan Ridge Walk, and finally look for gifts at AKU Boutique. For other places to visit, photos, ratings, and tourist information, read Ubud vacation planning tool . Traveling by combination of ferry and taxi from Nusa Lembongan to Ubud takes an hour. Alternatively, you can do a combination of ferry and bus. In August, plan for daily highs up to 34°C, and evening lows to 28°C. Wrap up your sightseeing on the 9th (Fri) early enough to travel to Cairo. 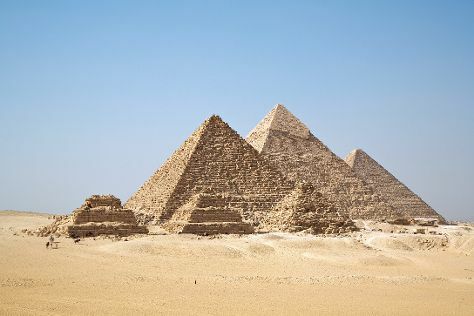 Venture out of the city with trips to Giza (Pyramids of Giza & Great Sphinx). Next up on the itinerary: delve into the distant past at Saqqara (Sakkara) Pyramids, admire the striking features of Khan Al-Khalili, take a stroll through Islamic Cairo, and see the interesting displays at Egyptian Antiquities Museum. To find more things to do, photos, where to stay, and other tourist information, you can read our Cairo visit planner. Traveling by combination of bus and flight from Ubud to Cairo takes 19.5 hours. Traveling from Ubud to Cairo, you'll gain 6 hours due to the time zone difference. When traveling from Ubud in August, plan for somewhat warmer days and about the same nights in Cairo: temperatures range from 41°C by day to 30°C at night. Cap off your sightseeing on the 12th (Mon) early enough to travel back home.